HIGH PERFORMANCE COACHING - NANDOR VERES, SR.
Nandor Veres, Sr. is a former national champion and national coach of Hungary. He has been an official Fed Cup coach of Hungary, an official coach at the 2004 Olympic Games in Athens, a certified ATP coach and one of the few certified WTA coaches in the world. He has coached players in all four Grand Slams: Wimbledon, Roland Garros, Australian Open, U.S. Open as well as many other major WTA and ATP tennis events. 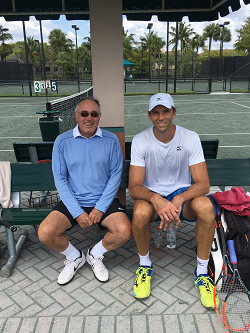 He has developed players who have participated in the Davis Cup and Fed Cup teams, including Melinda Czink, Monica Puig, Denis Shapovalov (in picture, left), Ivo Karlovic (in picture, below) and Peter Nagy (in picture, above). 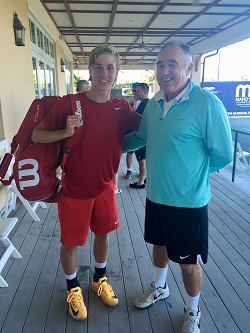 Coach Veres has also assisted top world ranked juniors around the globe in the ITF Junior World Cup, European and Scandinavian Junior Championships, and prestigious ITF tournaments such as the Orange Bowl and Junior Grand Slams. Some of his students have gone on to attend universities including Harvard, Yale, Stanford and Princeton.